Dear Dale, Every Thursday morning, our students practice writing about a variety of topics. Recently, the writing topic was “favorite books”. One of our third graders wrote a delightful story about your father’s books being his favorites. He is enthusiastic baseball fan (especially the Cubs), and a great student. 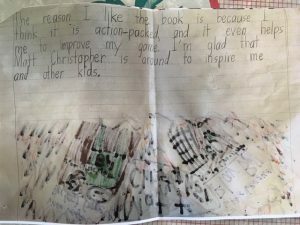 We wanted to share with you Colin’s story about his favorite author, in hopes that it will remind you of the positive impact your father’s work continues to have on young readers. Hello, I just wanted to write to say thank you. I read so many of these books as a young kid, and just seeing the covers of them could have brought me to tears. These books are a major part of my life and a big reason I am so into sports and Coaching High school football at such a young age. These books taught me to have an imagination. I would stay up for hours reading the books! I began to write my own books in the elementary school about sports and my teachers were always shocked about how much detail I put into my stories. I wrote for my high school newspaper for a long time and had great reviews from other teachers, players and parents. Overall, again I just want to thank you for the wonderful time you providing me as a young kid, I will never be able to repay you enough! Just wanted to send a note to tell you what a difference your books have made in our lives. My son discovered the series a year or two ago and has almost read the entire collection! It is so great to see him reading and excited about books! Sometimes I have to tell him to stop reading for fun when he has chores around the house to do : ) Thanks again for the GREAT books! — PS If you ever need a character name in a new book consider “Owen” – it is a great name! Reading is NOT my favorite subject in school, but when I read your books I want to keep on reading until the end. You are awesome! I would like to see more books about skiing and swimming. Thanks. My name is LTJG Greg Hinkle and I am an officer with VP-9 stationed in Hawaii and just wanted to say your books and the sportsmanship they promote stayed with me all through childhood and helped shape myself and many of my fellow servicemen and women to become the team players we are today. Thanks for sending out such a great message and helping to shape the youth of today to become winners every day. Thanks! I’ll look for those. I had searched high and low for easy chapter books for Craig to read about sports (baseball in particular) when I stumbled onto your Dad’s books. The great thing about them is that not only are they great for a beginning reader, but the easy use of baseball terminology and “color commentary” leave Craig (who gets up in the morning to read the Yankees’ box score) begging for more!We’ll look forward to reading many many more! I am just writing to say thank you for choosing the genre that you did. Firstly, I am a mother of three children, one daughter, who reads like it’s second nature and two boys, who usually fight every step of the way. That was until they read your books. My boys love sports, so they were highly interested right away. The second reason I am writing is truly why I decided to email. I am a literacy teacher of 7 years at the elementary level. I recently started taking coursework in dyslexia training, while concurrently tutor a dyslexic student. Well, knowing how much my boys loved the books, I decided to take our personal copy of Lacrosse Face Off, and read it with my student. Well..how motivated he is to read! He cannot wait until we get to the portion of the lesson where we get to read for understanding and enjoyment! 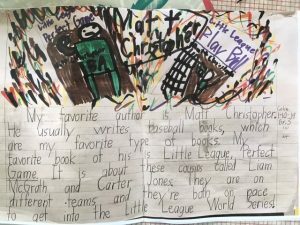 This next bit of information brought me to tears…tonight, he said to me…”I think I am going to ask for a couple of books by Matt Christopher for Christmas.” Yes! Christmas! You have surpassed electronics and whatever latest gizmo! After only about a month of reading (twice a week) your book, my student is going to put you on his Christmas list. I think that is truly amazing and I want to say thank you. Thank you for making a difference in the lives of my children and my student. Job well done!